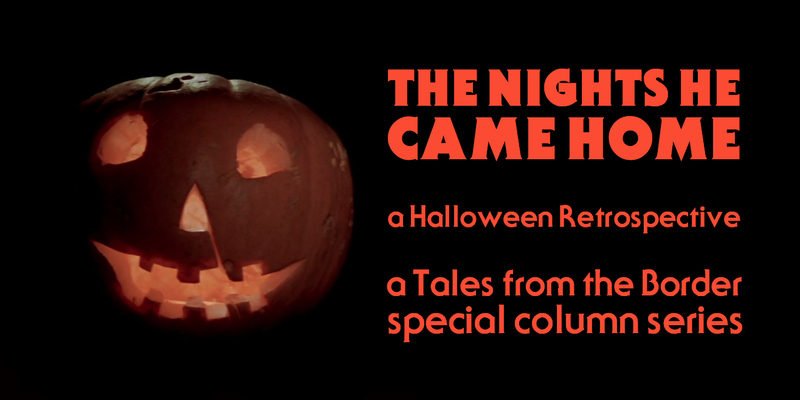 Welcome to the second part of The Nights He Came Home – A Halloween Retrospective! Over the course of October this new special column, in which I revisit all of the original Halloween films in anticipation of that most spooky season, will be running every Monday and Thursday. Then, beginning on the 26th of October, daily posts with the unifying theme of the horror genre will be posted, leading up to an article on my choice of the 10 greatest horror films ever made. Today we have a look at the first sequel in the series, Halloween II (1981), which upped the violence and provided a satisfying conclusion to story of Michael Myers, Laurie Strode, and Dr. Loomis. For previous entries in this series, click here. Halloween II does a lot of things right, and in many respects is a bigger, better effort than the original Halloween (1978). 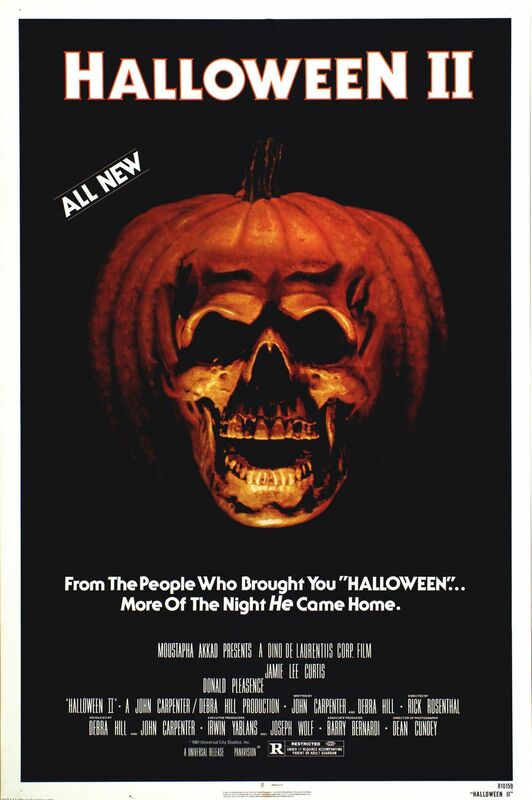 However, without the craftsmanship of John Carpenter, Halloween II unfortunately falls by the way side of the first. That’s not to say it’s a bad film because it certainly isn’t; only that the standard direction of Rick Rosenthal and a thinly plotted screenplay by John Carpenter and Debra Hill tarnishes what is actually a really good slasher film. The title credits of the original film are recreated in Halloween II, but with a spooky twist. Halloween II picks up immediately after the ending of the original. To drive this point home, viewers are treated to an edited down version of the last 5 minutes of Halloween as the opening. This is followed by a recreation of the original opening credits, only with a brilliantly conceived twist – the Halloween pumpkin opens up and reveals an under-lit human skull. It’s a brilliant effect and goes a long way to establishing the identity of Halloween II – a film that is bigger and nastier than the first. What follows is another hour and a half of Michael Myers stalking and killing those close to Laurie Strode as Dr. Loomis seeks to stop him. The setting is transferred from the streets of Haddonfield to Haddonfield Memorial Hospital. Whilst the film doesn’t quite live up to the potential it had in its daring concept, there is a lot to enjoy. I say this as someone who isn’t that big a fan of the slasher genre, but as someone who enjoys the films of John Carpenter and horror cinema in general. The violence is increased tenth fold and in one or two moments outdoes the gruesome deaths of the original – the most brutal death being when Michael Myers drowns a nurse in boiling water. Whilst I’m not someone who looks for gruesome violence in films, the added violence of Halloween II helps it compete with the much more violent slasher films that arrived in the wake of Halloween (1978). It also gives it a bigger bite than the original, something necessary for any sequel. Donald Pleasence is once again captivating as Dr. Loomis. To my pleasant surprise, Jamie Lee Curtis’ Laurie Strode takes a backseat in Halloween II, allowing for more monologuing and action from Donald Pleasence‘s Dr. Loomis, arguably the best character from the original film. Those who enjoyed his scenes in Halloween will find plenty more to enjoy here, where he becomes even more unhinged as Myers kills more and more people, and becomes more determined than ever to put an end to Myers’ rain of terror. This aspect of the film adds a brilliant layer of suspense that the original lacks. The hospital setting also provides a bigger staging ground for the events of the film, and it’s a great idea too. The film fully utilizes the setting. Those long corridors at night are wonderfully spooky, and the clever use of security footage to show Laurie Strode and Michael Myers wandering around the hospital at night is especially creepy. Haddonfield Memorial Hospital makes for a really atmospheric setting in Halloween II. Halloween II successfully replicates much of the filmic language of the first film; photographic representation of Myers stalking his victims remains exactly the same, and so does the use of point-of-view cinematography. It helps make the second film feel like a natural and necessary sequel to the first. However, as much as it successfully does these things, Rick Rosenthal is no John Carpenter. Even as Michael Myers is revealed to be a more supernatural figure than before, Rosenthal shows Myers too much in close up and in lighting. I can’t help but feel that because of this he looses some of the mystique that he had in the first film. Rosenthal isn’t a bad director by any means, as he satisfactorily shows here. But he can’t hope to compete with the talent of Carpenter. The festival of Samhain is used as a supernatural explanation for Michael Myer’s seeming invincibility. The film also seeks to expand on the content of the original by “enriching” the mythology of the series. The film introduces the Samhain rituals, which explain Michael Myer’s immortality, and also reveal that Laurie Strode is actually the little sister of Michael Myers, and that he is fixated on “finishing the job” and killing her. Whilst this is an intriguing element of the story, and defines the franchise from this point on, I think it retroactively takes away some of the creepiness of the original film. In the original film, Myers fixates on Laurie Strode because she dropped some keys off at the Myers house. It could have been anyone in her position, and that’s part of what makes the original terrifying. By adding this extra bit of plot, it does ruin some of the effect of the first. But it’s an intriguing element for sure. Perhaps the biggest charge that can be laid at Halloween II is that it is too thinly plotted. Really, I feel like Halloween II should have been the final third act of Halloween. It feels like a very natural sequel, and it does several things very well. But the film is slightly sapped of energy because it struggles to justify its running time. Despite this, Halloween II has a spectacularly explosive ending, with Dr. Loomis sacrificing himself to kill Myers in a massive explosion in the hospital. It’s a great supposed ending to the franchise. For this reason, Halloween and Halloween II is one of my favourite movie-pairings. Watching the two in a row makes for a great evening’s entertainment and it feels like one epic horror film. It’s a double bill that I highly recommend. The film had mixed reviews upon its release, with many claiming that it failed to live up to the original and was merely a cash-in, with no creators who firmly believed in the film they were making. Others however did note that it was a better film than the slew of slasher films that followed the release of the first Halloween. In more recent times the film has been viewed more favourably. However, despite these reviews, the film was a box-office smash, having grossed $25.5 million on a budget of $2.5 million, roughly about $67 million today. Despite some of the clumsier aspects of the film, Halloween II is thoroughly entertaining and is better than it has any right to be. It stands well beside the first as another great slasher film. With Carpenter not being involved in any of the sequels from this point on, I actually can’t imagine that any of the sequels would be better than Halloween II – but I’ll find out soon enough! Thanks for reading folks! Be sure to come back next Thursday for a discussion of Halloween III: Season of the Witch (1982), which would drop the characters and plot of the first two films completely and add doses of both witchcraft and science fiction. See you later for more of The Nights He Came Home!